How to add a lot of terms at once? The way to add a lot of terms is to use Import. Follow Exchange → Import → Terms. Recommended number of terms is 500. The number varies depending on server performance. The process of importing terms is a complicated task. There are a lot of transformations with text during the process. You can import 100.000 terms on a local machine but a web-server, especially on shared hosting, allows to import 500 terms or less at best. A 60-MB XML-file imports during ~10 minutes on Intel Celeron 1.6 GHz. 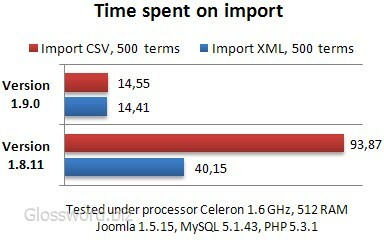 Time spent on import, seconds.